The 412 Commission students just got back from an amazing trip to Israel led by Dr. Randy Smith, shown here teaching the group. 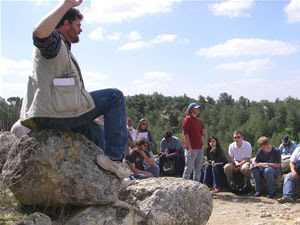 During the two weeks the group toured the country seeing various sites ranging from Old Testament cities to Armagedon. Dr. Smith, who is pastor of the Grace Brethren church in Sebring, Florida, lived in Israel for a number of years and is a recognized expert in the history, geography, and Bible-lands context for the scriptures.